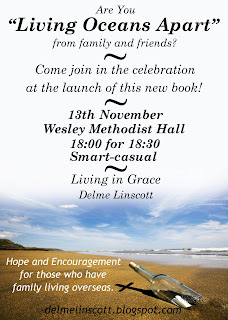 Please pray for the launch of 'LIVING OCEANS APART' - We really believe that God has a wonderful plan for the book and that many people will be encouraged through it. Thanks and God Bless. Christian leader Eddie Gibbs wrote that 'leadership is more often about scars than stars!' What a powerful insight into the cost of leadership. I have just had the privilege of speaking to 100 School leaders at their SCA leadership camp. One of the talks I was asked to do focused on the 'Cross of Leadership' - the idea was that we understand that when Jesus called us to come and follow him, that he insisted that we be willing to 'carry the cross.' Many leaders are more than willing to lead when we have seasons of 'Stars' - the moments of glory and success. However, many of these same leaders bail out when those 'stars' turn to 'scars.' We all know the painful burden of leadership, and I want to suggest that being a true Christ-centred leader involves many scars. May we not be tempted to give up when we face those difficult moments - Christ has called us to 'lead where we are.' As we lead with passion and focus, we set a godly example for the next generation of leaders. May they become men and women who are prepared to count the cost of following Jesus and then leading bravely for Him. Lead Well today my friends! Go in the knowledge of His Grace. God is my refuge and strength - a very present help in times of trouble. At the time the Psalmist wrote these words I am sure that he had just come out of a very trying experience. Perhaps things had seemed hopeless and 'dark' - yet in the end the Lord came through for him and he ended up acknowledging how awesome God is. I can relate to how he felt - it seems that I have just come out of a similar place. Family illnesses, stresses of ministry, general tiredness and having just given loads in terms of spiritual 'output.' As I reflect on the past week, I want to proclaim that "God is my refuge and strength!" I have only managed to get through these past 7days by his strength and grace. Thanks Lord for keeping your eye on me - in my weakness you have been strong! Have a blessed day. Remember to live in His Grace! In my devotion this morning I was reminded of a powerful scripture from Deuteronomy 33:12 - "Let the beloved of the Lord rest secure in him, for he shields him all day long, and the one the Lord loves rests between his shoulders." The image that this verse conjures up is on of a loving parent holding us close to their heart - we are the children of God and according to the Bible we 'rest between his shoulders' -which is by His heart. This is awesome news! When I am feeling tired and weary, I can rely on the grace of our Saviour to hold me close to His heart! Thanks the kind of grace I am talking about!I am weak, but you are strong, Lord. In the early days of my faith there was a poem that did the rounds, which emphasised 'Letting Go and letting God!" The context of the words centred around us getting to a point in our relationship with Jesus where we trusted Him enough with everything and where we were able to let these things "go" into His hands. I have been brought back to this point in my relationship with the Lord this week - but this is mainly in terms of the book. After having worked for a long time on shaping the book, I have now handed it over to the printers - we did this yesterday. I found it to be both an awesome rush, as well as a hard discipline. I literally have had to let go and let God. It is now in the hands of God and the printers. God you lead us on this fantastic adventure of Faith. I look forward to seeing Your results. Remember - "Let GO and let GOD!" Roll on the 13th November 2008. Another thing that hit me whilst attending the Leadership Summit was when someone asked the question: "Are you in Full-Time ministry, but have become a Part-Time Christian?" Oh NO, another hammer blow to my fragile ego. Boy, oh boy, I really have to be careful about placing myself in meetings where the Holy Spirit is going to challenge me. It is far to easy to be in full time ministry and to get caught up in 'running' a church, whilst slowly your faith erodes away. If I am honest, I had started to slide towards mediocrity and complacency - being a Christ follower was comfortable! But, I don't want to be a part time follower of Jesus! I desire to give Him everything. I can't stand lukewarm coffee/tea and when I take a sip of it I certainly want to spit it out my mouth. It is little wonder God wants to do the same with my feeble, cushy, namby-pamby attends to follow Him. Jesus you are radical and I want to be your radical Disciple. Challenge me to ask myself: "Am I Full-Time or Part-Time?" Bring it on God! Your disciple in training, living in your grace. Last Friday and Saturday we went along to the Global Leadership Summit in Durban and yet again I was greatly encouraged and incredibly challenged. There were many awesome 'one-liners' (or 'Axioms' as Bill Hybels calls them) that impacted me. Of the many quotes from the course, the one that is still haunting me comes from Gary Haugen - "In this world of need and suffering, why have I been given so much?" Oh my goodness, I wish he had never said that! He is right, of course, and it was the kind of 'slap upside the head' that I needed. I think I will be living with this thought for a while yet. I just pray that I would be able to honour God with what He has given to me. I am certainly trying to change my perspective and not focusing on what I don't have, but rather on what I do have - I have been dealt the cards, now I need to do something with them. I have to quit worrying about the cards in the hands of others and make sure I make my cards count! Oh Lord, please help me in this. To my fellow Christ followers, may Christ be near you today. Well, the paw-paw has hit the fan. My whole family is sick - the flu and Chicken Pox has gripped the household. At the moment I am the only one who is free of anything, but I am half expecting to be man down soon. Just reflecting on how easily everyone has been infected with the various viruses, I was wondering how awesome it would be if people received Christ as easily. Can you picture the scene - we walk into the Supermarket/Mall and the Spirit of God in us bursts into the atmosphere and a few days later everyone is converted and praising the Lord! Mmmh, why didn't God make it that easy? Many people refuse to accept Jesus because they can't figure Him out in their minds - they can't get their heads around the Saviour of the world dying on a cross. For me, I have come to accept that I will never figure it all out - I have got to a place of trusting what I feel/know in my heart. Jesus loves me! No one can tell me otherwise! As I continue to live as a Christ-follower I pray that I may be a "Contagious Christian" (Bill Hybels) - there are millions of people who need to 'catch' the Good News of God's Grace! Living with Grace in my blood! I know that the Bible tells us loads of time, "Do not fear!" or "Be strong and courageous!" but these last few days I have been swallowing hard - I have been 'gulping', if you like. It has suddenly dawned on me that the book I have been working on for 18 months is about to go to the printers. That means in 6 weeks time many people are going to be reading my thoughts and making their own quick judgment call on the contents of the book. Whilst the journey of writing a book is awesome and a great adventure, it is also a great responsibility. I now have to trust in the power of God to work through the pages of the book. I firmly believe that the Lord has led me throughout the whole process and He will not bail on me now. Anyway, I will take a few more big 'Gulps' before the end of November and we will stand back and watch how the Lord moves. God you are gr8. The adventure continues.